The Sacconis all have busy and successful musical careers outside of the Quartet, and while others are busy relaxing over Easter, they can be found playing in Music Festivals across the UK. Firstly, in early April, Ben is off to play in the Kinnordy Chamber Music Festival, the home of which is the beautiful Kinnordy Estate on the outskirts of Kirriemuir, Angus. This is a rare opportunity to hear chamber music in the setting for which it was written. Full details can be found at the Kinnordy Chamber Music Festival website. Meanwhile, Hannah and Cara are heading up to Yorkshire next week for New Paths Festival., where they will be joined by some great friends and musicians. Works to be performed include Schubert’s Trout Quintet, Ravel’s Quartet and Mendelssohn’s dramatic piano trio in D Minor with festivals Artistic Director, Libby Burgess and violinist Jamie Campbell. Please do go along and join in if you are in the area. All information for concerts can be found at the New Paths Festival website. And not to be outdone, Robin is playing a concert with the Rautio Piano Trio at Kings Place in London, on the 12th May. Full details can be found at the Kings Place website. We are currently working on continuing our long-term aim of working with and commissioning from the best of British composers, performing their works and making them available on recordings. 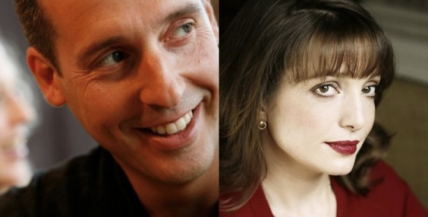 Last year saw commissions and recordings by Graham Fitkin, Jonathan Dove and John McCabe, and we are now making further plans with two composers – Roxanna Panufnik and, once again, Graham Fitkin. Projects of this kind inevitably come at a price, and we are proud to be supporting some of the best of British contemporary composers. As well as seeking funding from grant-giving trusts, we would like to involve our Sacconi friends in the evolution and funding of these pieces. 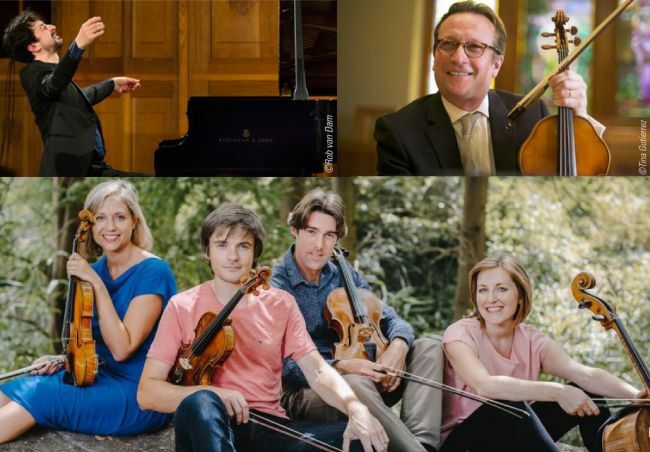 Drawing on the success of our first raffle in 2015/16, we have now launched a new raffle, again with the chance to win a performance by the Sacconi Quartet at a venue of your choice. We also have a second prize of a limited edition print of a stunning painting of the quartet by artist Emily Patrick, and further prizes of ten of the new CDs mentioned above. As before, there are one hundred tickets at £100 each. 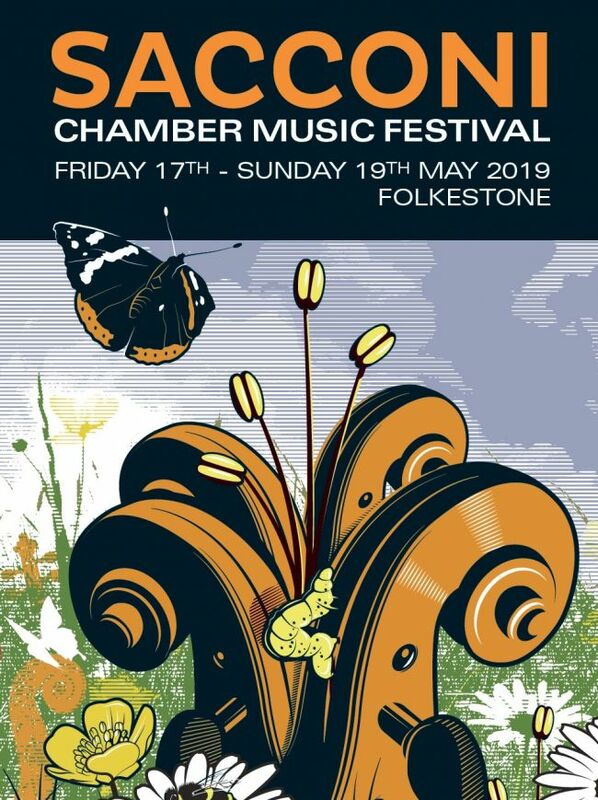 The draw will take place at the Sacconi Chamber Music Festival in Folkestone on 19th May. You can purchase tickets by clicking the Paypal button below, or in person at any of our concerts, by or by emailing us at info@sacconi.com. As always, we are indebted to all of you for your support and enthusiasm for this endeavour. Festival Box Office Now Open! The Sacconi Quartet return to Folkestone with their 12th Annual Chamber Music Festival. This year they are bringing some very special guests; including welcoming back the extraordinary pianist Tom Poster, who will join them for Korngold's sumptuous Piano Quintet. Eminent violist Philip Dukes will also join the Sacconis for a quintet, this time Beethoven's tempestuous 'Storm' Quintet Op.29. A hand-picked string orchestra from the Royal College of Music will be directed by the Sacconis in a thrilling concert including John Woolrich's haunting 'Ulysses Awakes' for Viola and Strings, and Bartok's Divertimento for Strings: one of the genre's greatest works. Other repertoire includes Mozart, Haydn, Grieg and Schubert. The Sacconi Festival programme has been launched! Thank you to all the Sacconi Friends who came along to our Christmas Party in London last week and helped us celebrate! The full programme can be found on the Festival page here. We will be delighted to welcome some very special guests, including pianist Tom Poster, violist Phil Dukes, the Kosmos Ensemble and a specially selected chamber orchestra from the Royal College of Music. The box office will open early in the New Year, watch this space for updates! Sacconi Commissions - and Raffle! Roxanna Panufnik (born 1968) has written a wide range of pieces – opera, ballet, music theatre, choral works, orchestral and chamber compositions, and music for film and television – which are performed all over the world. We plan to commission Panufnik to write us a string quartet, which will be premiered at Folkestone 2020 and recorded for Signum Classics. Graham Fitkin (born 1963) composes for concerts, dance, film and digital media and runs his own ensemble of 9 soloists. Having worked recently in the same festival with Graham and exceptional saxophonist Simon Haram, we would like to commission Graham to write us a piece for saxophone and string quartet, to be premiered at Folkestone 2021. Our second CD of Graham’s music will include this piece, Recur for Harp and Quartet, written for harpist Ruth Wall and us in 2016, and other currently unrecorded works. Projects of this kind inevitably come at a price, and we are proud to be supporting some of the best of British contemporary composers. As well as seeking funding from grant-giving trusts, we would like to involve our Sacconi friends in the evolution and funding of these pieces. Drawing on the success of our raffle in 2015/16, this December we would like to launch our second raffle, again with the chance to win a house-performance by the Sacconi Quartet at a venue of your choice. We also have a second prize of a limited edition print of a stunning painting of the quartet by artist Emily Patrick, and further prizes of ten of the new CDs mentioned above. As before, there will be one hundred tickets at £100 each. We will launch the raffle in December, with the draw taking place at the Sacconi Chamber Music Festival in Folkestone on 19th May. You can purchase tickets at any of our concerts, or by replying to this email. As always, we are indebted to all of you for your support and enthusiasm for this endeavour. Hannah, in one of her many associations outside of the Sacconis, is performing at Wigmore Hall on Saturday 15th Septemper alongside Donald Grant of the Elias Quartet, in his own quartet, the Donald Grant Quartet, which takes a particular interest in Scottish Folk music. In this family-friendly performance the Quartet are joined by presenter Lucy Drever for a concert exploring Scottish folk music, featuring a specially commissioned film projected live onstage. This concert delves into the mysterious stories of Scottish folklore and the unique soundworld of Scottish traditional music. Full details can be found at the Wigmore Hall website. Different Trains and Juliet Letters! We’re excited to be giving two performances of Steve Reich’s Different Trains in September. This will be paired with The Juliet Letters, and we’re delighted that the great Jon Boden will be singing with us once again. The two performances will be in London on the 6th September (tickets available here), and at St George’s Bristol on 7th September (tickets available here). Do come and join us for the rare opportunity to hear these great works. This Summer Bank Holiday, most of the Sacconis (Hannah, Robin and Cara - Ben is off on a well-deserved holiday) will be taking part in the Vaughan Williams Festival in Down Ampney between 24th and 27th August 2018. They will be part of the Vaughan Williams Ensemble, performing alongside other well-known musicians for this special occasion. Hannah, Robin and Cara will, between them, be performing in three of the concerts; on Sunday 26th August at Noon, again the same day at 7pm, and finally on the Bank Holiday Monday at 2:30pm. Full details of the Festival can be found at the Vaughan Williams Festival website. Do come if you are missing the Sacconis over the Summer! This Summer, both Cara and Hannah will be performing outside of the Quartet in a pair of prestigious music festivals around the UK. First up, Hannah will be playing in the Marylebone Music Festival on Friday 22nd June, alongside the likes of Alasdair Beatson and Daniel Rowland. The evening will feature 'Chamber Music filled with musical Cryptography' with pieces from Brahms, Schumann, Britten and Shostakovich. Full details, including ticket information, can be found here. The next day, on Saturday 23rd June, Cara will be performing with her string trio at the St Magnus International Festival set in the magical ancient landscape of the Orkney Islands. She will be playing with them as part of a new project playing Bach's Goldberg variations. She recently had a residency discovering this work and the Trio has also commissioned five different composers to write short pieces of Scottish traditional and contemporary classical music to go alongside it. Full details including ticket information can be found here. Two days later, on Monday, she has another concert at the Festival, performing Franck’s late Quintet, a dark and impassioned work whose first pianist was Saint-Saëns. Full details here. The General Data Protection Regulation (GDPR) is designed to make it simpler for people to control how organisations use their personal details (for example name, address and email address). As part of the new regulation, we have to obtain your consent once again to communicate with you using your information. We recently sent everyone on our mailing list an email about it, and we're asking you to respond before 25th May, which will take you less than a minute. If you don't, we won't be able to contact you again after that date. We will be sending out follow-up emails, so don't worry if you've mislaid it. We value our supporters enormously, so please don't forget to respond to this email so we can continue to tell you about all our concerts, festivals and other events. It's easy to opt out of our emails at any time: you'll see a 'SafeUnsubscribe' link at the bottom of each one. Not only is Hannah playing another concert at Wigmore Hall with the Sacconis, but she is also playing there with another of her many and varied music collaborations. She is there for two concerts on Sunday 8th April with the O/Modernt Chamber Orchestra, led by Hugo Ticciati. O/Modernt, Swedish for 'Un/Modern', is the concept devised by violinist and director Hugo Ticciati which explores with expressive freedom the vital connections between all musics, leaving the final and most important ingredient in the creative fantasy of the listener. The first concert, at 3pm, is titled 'Transforming Spanish Sexuality: The Chaconne', and is followed at 7:30pm by the second, which is with with The Cardinall's Musick. Do come along and make a day of it! The two concerts coincide with the launch of 'White Light', which is the debut album for the O/Modernt Chamber Orchestra. Full details, and a trailer video featuring Hannah, can be found here. Cara is delighted to be playing again in the 2018 New Paths Festival, in Beverley. She is a veteran New Paths artist, having played in all of their festivals since inception, Cara and her fellow cellist, Torun Stavseng, are the backbone of the Festival's string section, playing in too many concerts to list here. 3: Beethoven’s Twelve Variations on ‘See, the conquering hero comes’ in Songs of Praise. Full details can be found at the New Paths website. We are delighted that our latest CD, Graham Fitkin's complete works for string quartet, has received a tremendous review from Catherine Nelson in The Strad magazine. She enthuses about Fitkin's economy of means, and comparing music for strings to that of Philip Glass, and also compliments our playing, noting that we are "...clearly at home with Fitkin’s lush textures...", as well as the overall quality of the disc "...recorded sound here, as throughout the disc, is impeccably crisp, clear and inviting." She concludes her review by noting that "Fitkin’s affinity for strings is clear in this most transparent of writing, and the Sacconi Quartet draws out its wealth of beauty." Thank you Catherine and The Strad! The box office for the 11th Sacconi Festival in Folkestone, 18th – 20th May 2018, is now open! This year, the brilliant London Bridge Trio join the Sacconis in Schoenberg’s ‘Verklärte Nacht’, South African cellist Abel Selacoe and his band Chesaba bring the sounds of his home nation to the Quarterhouse with an eclectic mix of instruments and vocals, pianist Daniel Tong joins the Sacconis for Brahms Piano Quintet, and we feature composer Graham Fitkin in our extended Friday concert. Plus, eminent cellist Moray Welsh will help round off the Festival with Schubert’s String Quintet in C major. Other repertoire includes Haydn, Beethoven and Shostakovich. Here’s a video snapshot of our 2017 Festival! Tickets can be bought by clicking the PayPal link, below (you don't need a PayPal account). See here for further details. Festival 2019 - box office now open!